WP554 is a luxurious and elegant 4 bedroom, 3 bath vacation rental that accommodates up to 10 people. The living room becomes a focal point for relaxation with its leather couch, love seat and over-sized chair in front of the gas fireplace and big flat screen TV/DVD and complimentary Wi-Fi. 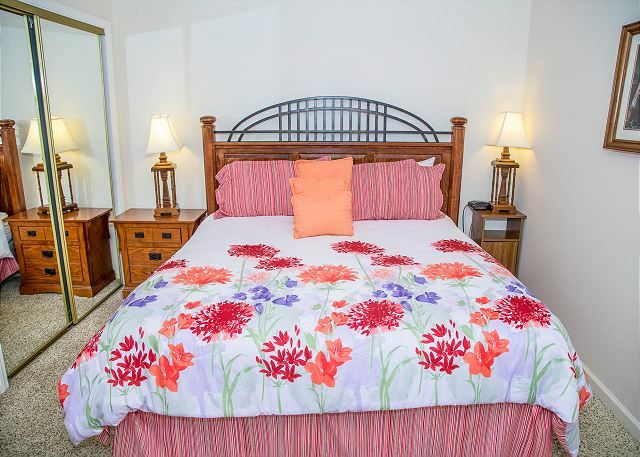 Each of the 4 bedrooms have king sized beds, TV and side chair, and the master has a Whirlpool tub. Enjoy cooking in a full kitchen and having a meal at the dining room table, or step out to the balcony with outdoor dining and rocking chairs. You’ll love the Smoky Mountain views and evening sunsets. Condo was clean and ready to use. Staff was wonderful to work with. We have stayed here before. Love the location. Quick access to everything. Will be using this property again. 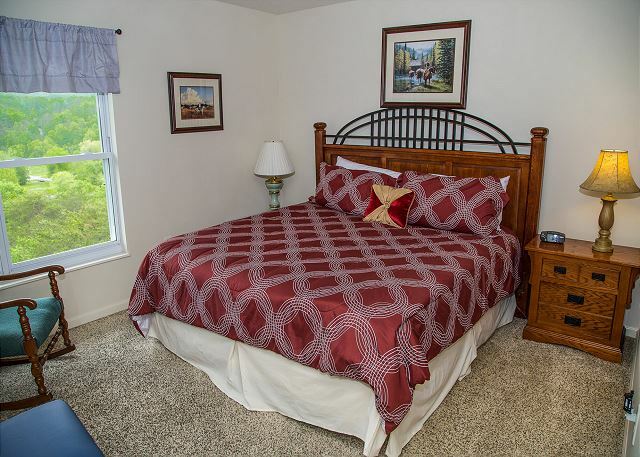 It was our pleasure for you to stay with us at Whispering Pines Condos in Pigeon Forge. We are glad that you had an excellent time and that you plan to return. Our annual girls’ getaway stayed at Whispering Pines again. It was wonderful as always. We love the space - enough to enjoy together or have individual space. It can sometimes be a little challenging to get the right "recipe" for a perfect vacation, but you did it and it was wonderful as always. Thank you for your patronage, and we look forward to your return. This was a truly wonderful experience. The ladies were so kind and so helpful with booking our shows and helping us navigate the traffic. We will stay her again! We look forward to your next stay, also. It is our pleasure to know that you had such a wonderful visit with us. Sending smiles your way. Considering we had 9 people (aged 3 to 80)including two teenagers space was more than sufficient. The balcony was great, as was the view. Staff was very helpful, room was clean and ready to go upon our arrival. A couple of issues that did arise were dealt with quickly and to our satisfaction. We found the main living area slightly over-full of furniture but we assumed it was to accommodate the large number of guests meant to occupy the room. Overall,very satisfied- will stay again. Thank you so much for choosing Whispering Pines for your family get together! We're glad to hear you enjoyed the view and found the condo to be spacious for everyone's comfort. We appreciate your compliments of our staff. We always want everything to be perfect for our guests but unfortunately things do happen. So thank you for bringing any issue to our attention for us to resolve as quickly as possible. Your wonderful review means the world to us and we hope to see you again soon! Was a very nice room, great view from balcony, nice facility, so enjoyed our stay at Whispering Pines. Thank you for your visit, review and comments. Yes, the mountainous view from the balcony is awesome and we look forward to your return. Will Stay in 554 Again! We enjoyed our comfortable stay in the updated and roomy condo #554. We had 3 couples and 2 of those couples had children ages 3 and under. While we could have easily stayed in a 3 bedroom unit, we really liked the looks of this four bedroom unit and who couldn’t use an extra bedroom? It worked out great as a playroom by day and a bedroom by night. Great place! Thank you for staying with us at Whispering Pines! We're extremely happy to hear that you all had a comfortable and wonderful vacation together. It sounds like you really took advantage of that extra bedroom and we love hearing about the creativity you all used to make it an even better stay. Condo 554 is truly a beautiful unit that offers breathtaking views of the mountains. We hope you'll stay with us again the next time you're in Pigeon Forge, and don't forget to request unit 554! This rental unit was pretty close to perfect. The condo is spacious and very well decorated and the staff does a great job of making you feel welcome. The view from the balcony allowed me to take a world class photo of the evening sunset in the Smokies. My only regret is that I couldn’t stay longer. Thank you so much for staying with us at Whispering Pines! We cannot express into words our appreciation of you and your compliments. You will definitely have to show us that picture you took, we'd love to see it. Reviews like these are the reason why we love what we do and are what we are here for. We truly thank you for your kind words about our staff, property, and experience vacationing with us! We hated to see you go but we will definitely see you again whenever you're ready for another piece of heaven. We welcome you back very soon; we certainly look forward to it! Great stay, 10 of us 6 adults 4 children and had plenty of room. Loved the balcony and view great location. Thank you for staying with us at Whispering Pines! We are so happy to hear the whole family could come and stay with us and be comfortable. We appreciate you and hope to see you all again soon! We take a girls trip once a year and always choose whispering pines because of its location and value. Only thing I can say is no equipment in the gym worked and we reported it but it was never fixed. We love to hear that you enjoy staying at Whispering Pines for your Girls Getaway. Thank you for your kind comments regarding our convenient location and great value. We are aware of that the treadmill is not working, a new motor as been ordered and we are waiting for that to come in. We are terribly sorry for the inconvenience of not being able to use the treadmill during your stay. We appreciate your review and look forward to seeing you again soon. We absolutely loved it ! We brought our family here for Christmas and it was perfect! The view was amazing! I want to come back in the summer ! So glad you and your family had a wonderful time with us! Yes, please do come back in the summer...the Lazy River and Outdoor Pool are great to relax by in those hot months. Thanks for vacationing with us and come back again soon! Thank you for your perfect review and visit. Hope you had a great time; we look forward to your return. Our condo was great. Our plans is to go back next year. Thank you for staying with us at Whispering Pines. We are so pleased that you enjoyed condo 554. We can't wait to see you next year if not before. We appreciate your review. view.Water pressure was great, and the kitchen had everything we needed (full disclosure: we ate out every meal except breakfast).Outdoors, the grills worked perfectly, were clean, and the eating area was large. We used the lazy river , pool, and whirlpool. The pool area was clean and so was the water. One of the older guests really appreciated the whirlpool to ease the aches and pains. Check in and check out was effortless. 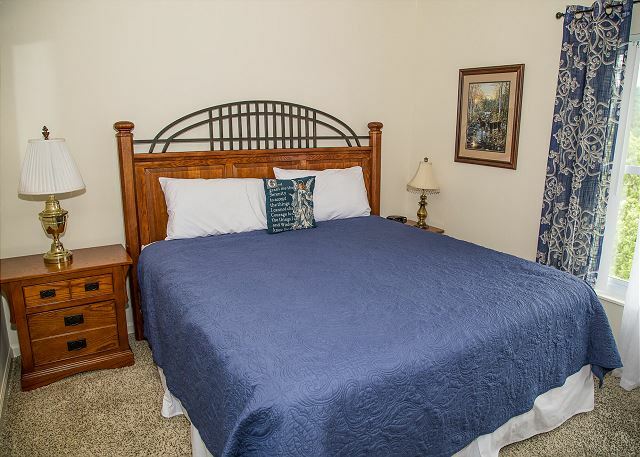 For proximity to Dollywood, Gatlinburg, and easy access to shopping, this is the place. I hesitate to write such a good review and give away our "family secret", but this place really deserves the positive reviews. We have stayed here at least 6 times, and will be coming back. Your secret wonderful place to vacation is no longer a secret so you should book early in order to get your dates. Your comments are wonderful and we appreciate them and your perfect review. Thanks for your patronage. We look forward to your return visits. Wonderful! Thank you so much for staying with us at Whispering Pines. We could not be happier to hear that you had a great experience while visiting with us. We appreciate your feedback and look forward to your next visit. Thank you for staying with us at Whispering Pines. We are so happy to know that you enjoyed your stay. We appreciate you and look forward to seeing you again soon. Made us feel like we were home. Condo was in perfect location for access to all the fun places. We are so happy to hear that you felt right at home during your recent stay with us. Thank you for your wonderful review and we welcome you back to stay with us again soon. Love this place. Stayed there last year. Only problem was we ran out of hot water frequently this year. Thank you for being a loyal guest with us at Whispering Pines. We love that you love staying here! Please always let the front desk staff know of any issues you encounter during your stay. Our maintenance department would have been happy to check the hot water issue. We appreciate your review and look forward to your next visit. We have stayed at this property for the last several years and have always been completely satisfied. We never even consider staying anywhere else. The entire condo and the outside property has always been clean and very well maintained. Great location, restaurants, shows and activities. You will not be disappointed with this choice! We greatly appreciated your patronage, excellent review, and comments! We treasure your "golden nugget comments" like: stayed here for years, completely satisfied, stay no where else, always clean, well maintained, great location, not disappointed. May these wonderful experiences continue for years as you return to visit us at Whispering Pines Condos in Pigeon Forge, TN. Thank you. We had a wonderful time. Our condo was perfect. We are so thrilled to hear this! Thank you so much for staying with us and we hope to see you again in the future. This is the first year we've stayed with this resort and we were very pleased. In the past we have rented houses and that puts us on different floors as well as having to carry our luggage to different floors. The condo, with elevators was very much appreciated. The layout/floor plan of our four bedroom condo was wonderful! (Huge and all on the same floor!) The furniture in our unit was nice and comfortable. We very much enjoyed the free DVD's and watched four during our 3 day stay. My only complaint was a few of the area rugs were very soiled and stained. We had an issue with the A/C while there and it was dealt with promptly by a very nice service man. We think this agency will be our new found location for our annual trips! Probably even for any other trips we take to the area with our families. Thank you so much for staying with us and all the kind words! 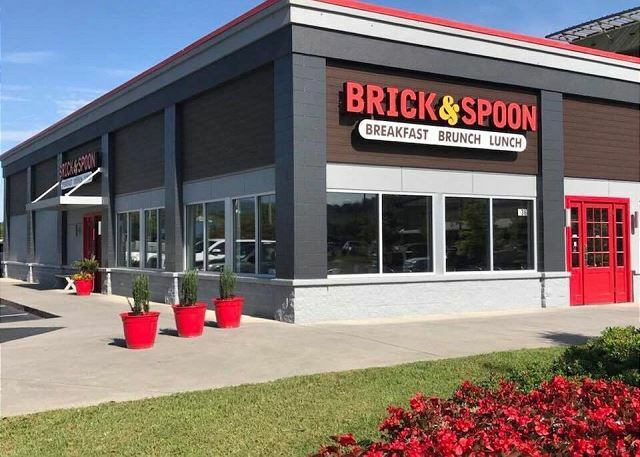 We are thrilled you chose us as your home away from home while in Pigeon Forge, we hope you will come back and see us again soon! We had a great time and it felt like being at home. Great Rooms, Great view, Great customer service!! Thank you! We were glad to have you! Thank you for being a loyal repeat guest at Whispering Pines. We really appreciate your kind words regarding our staff. We love having you as our guest and can't wait to see you again soon. The Condo furniture was great and the recliners in living room my brother-in-law liked. I wished the bathrooms had handicap bars in tub, my parents are in their 90 and needed something to use to pull up by. So glad you enjoyed the condo! The owner of that condo will be so happy with your comments regarding the living room furniture. Thank you for vacationing with us and come back again soon! We had a great time. Enjoyed every moment. Loved the view. Loved the accommodations. Kitchen was well stocked with supplies for cooking. Almost everything was in working order. Thank you for your visit and excellent review of unit 554 at Whispering Pines Condos in Pigeon Forge, TN. We are glad that you had a great time and enjoyed every minute. Please let us know if anything in the unit needs our attention/maintenance. Looking forward to your next visit. We enjoyed our stay at WP 554. The condo was very nicely decorated and clean. The condo was spacious and we were very comfortable. Thank you for your kind comments about the condo! So happy to hear you all enjoyed your trip with us at Whispering Pines. We can't wait to have you stay again! Have always stayed in a cabin but decided to try condo. Great decision. It was so conveniently located, the condo was clean, quiet and roomy. Would stay at Whispering Pines again and again. We are so glad you decided to give a condo a try! It's great to hear you had a wonderful experience with us. We hope you make it back to Pigeon Forge soon and decide to stay with us again here at Whispering Pines. This condo was awesome! It was spacious, clean and comfortable. We had an issue with a bedroom door lock being broken when we arrived and maintenance came up immediately and replaced the lock. We will definitely be staying here again! And the location was perfect! Thank you for staying with us at Whispering Pines. We are excited to hear that you had an awesome time staying with us. We are sorry that you had an issue with your door lock, however we are glad that our maintenance department was able to fix it promptly. We appreciate you and hope to see you again. We arrived and condo was very clean and roomy and the office was very nice and helpful.I went last year for Spring break and used Aun't Bugscabin's rentals and My grandson got sick in the middle of the night and vomited on covers and they charged my credit card an extra $200 for cleaning without my permission and I called dry cleaners around the area and the cost for cleaning comforts were between $23 - $30 and I was very upset but since that time I have been there twice and they have missed out on around 1500 dollars because that is what has been spent on lodging.I ask how they would have handled that situation and they said that would never happen.I would never ever recommend Aun't Bugs but would recommend this rental property!!! We are sorry about your unpleasant experiences elsewhere; glad you found us. 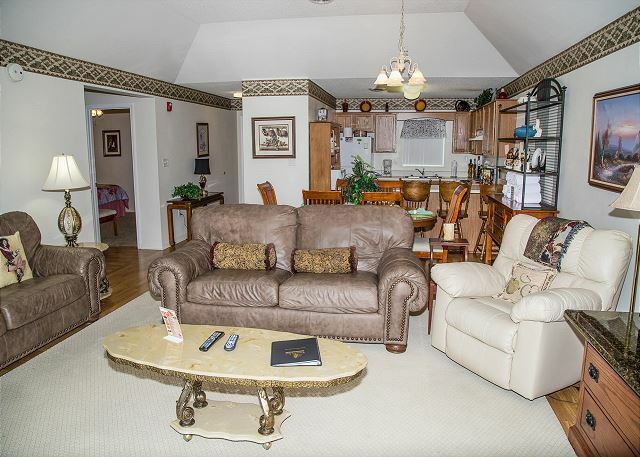 We are happy to hear that you had a great stay with us in unit 554 at Whispering Pines Condos in Pigeon Forge, TN. See you next trip. 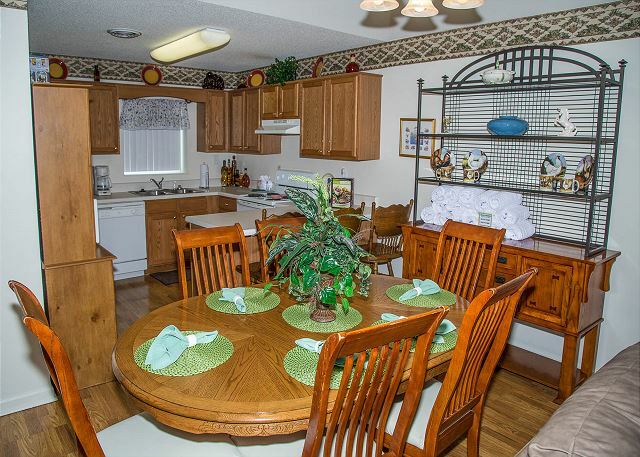 We are glad that you will be returning to Whispering Pines Condos in Pigeon Forge, TN. 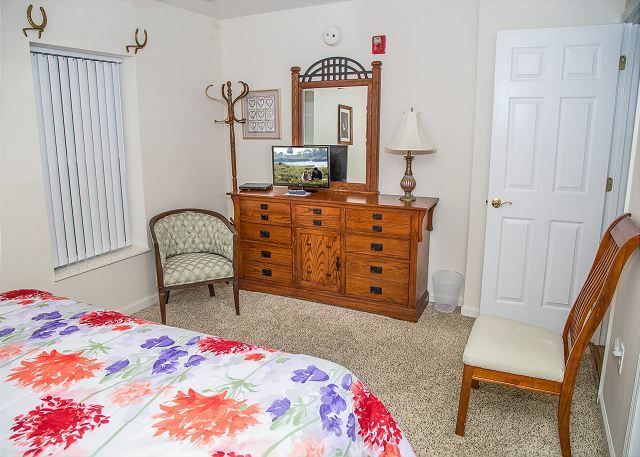 The indoor pool is a little walk from the unit in which you stayed; hope you discovered the private dressing room in case you want to wait until you get to the pool before changing into your swim suit. Our four bedroom units are located in buildings 5 and 6. If you like, you could drive near the pool building since we do not have assigned parking. Whispering Pines is in a great location; glad you enjoyed your vacation with us. See you next time. Thanks for your excellent review. The room itself is wonderful. We only have one complaint - All the beds are really uncomfortable. It's like sleeping on boards. 4 bedrooms and three baths and they added some more living room furniture this year which worked out great for Super Bowl night. Thanks for the great weekend! Thank you for your visit and review. We will pass the comment about the beds on to the owner; glad you had a good Super Bowl night. The property was great, everyone had a great experience. Thank you for your review and excellent ratings. We are glad that you had a great vacation with us at Whispering Pines Condos in Pigeon Forge, TN. We look forward to your return visits. the view was great the condo itself was well supplied very clean and great location. only thing knowone in office when we got ready to leave at 7 a.m. So we had to wait. Thank you for staying with us at Whispering Pines. We are glad that you enjoyed the view from the top floor. Our office opens at 8 am however we do have a key drop slot at the front door as well. We hope to see you again soon. Thank you so much for your awesome review of your recent stay at Whispering Pines. We love to hear that you would recommend our resorts to anyone. We appreciate you for being a loyal repeat guest and for your kind comments regarding our our staff members. We look forward to your next stay with us. Thank you for your review. We are glad that you enjoyed your stay at Whispering Pines Condos in Pigeon Forge, TN. We had a great vacation and the condo we stayed in was great! We had three families staying in the condo which was a total of nine people. Not one time did I feel crowded. The condo was clean and very comfortable feeling. My son, who is four years old, said he wanted the condo to be his home! We are so glad that you enjoyed staying in condo 554. We are happy to hear that you had plenty of space for your family and that it comfortable and clean. We love to hear that your son wanted the condo to his home, kids are just adorable. We hope that you can visit us again in the near future. Very satisfied with our stay and with the condos. 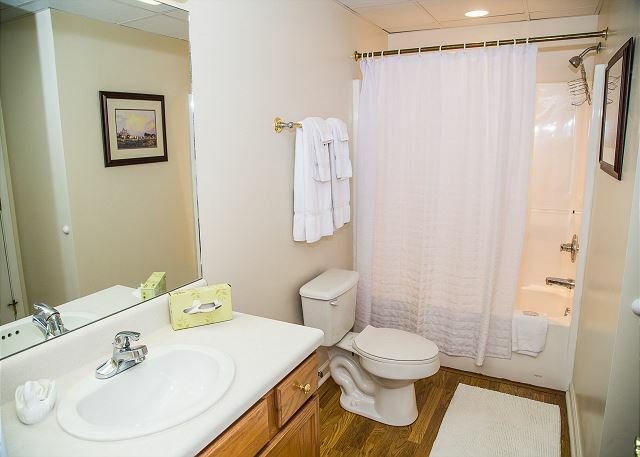 The property was in good condition; the location was great and the property was very clean. I will recommend Whispering Pines to a friend or coworker. Thank you for staying with us at Whispering Pines. We appreciate your kind review and for recommending us to friends and coworkers. We hope that you can visit with us again soon. This condo is right in the middle of all the action. We walked from our condo down the river walk to The Island - very nice walk if you like walking. The kids liked it because they could walk to things at night. Very safe. Thank you for staying with us at Whispering Pines. We are glad to hear that you enjoyed the location of our resort. We appreciate your review and we hope that you will visit us again. We had wonderful stay. The condo was great, very clean and the layout was perfect for us. The only suggestions I have is that the kitchen was poorly equipped. Due to medical concerns, we cook in a lot. Very limited kitchen On a return trip, I would take my own pots and pans etc. For ex, the spatula was so flimsy, I could not turn an egg with it! Otherwise, GREAT. Would definitely stay again. Thank you for your feedback! We are pleased to hear you enjoyed your stay while staying in condo 554 at Whispering Pines. We will be sure to pass along the information about the kitchen spatula. We appreciate your patronage and look forward to your next visit! Recently my wife and I, along with our son and daughter and their families, spent 7 wonderful days at Whispering Pines. We stayed in condo #554, and the pictures on your website were an accurate depiction of the condo. There was a total of nine of us and the condo provided a perfect place for us with plenty of room to spread out and either spend time together or some alone time if we wished. The kids spent a lot of time in the pool and the adults made good use of the gym on the property. Whispering pines provides a great location for us - close to everything in town yet secluded from the noise. We have been staying with you each year for more than ten years now and wouldn't think of staying elsewhere. We always look forward to our time with you. Thank you for your wonderful review! We so are pleased to hear you continue to enjoy all that Whispering Pines has to offer. We appreciate your loyalty to us and look forward to seeing you next time! We really enjoyed our stay at Whispering Pines. The condo was better than expected and the facilities were very nice. The staff was great. Only negative was a 3:00am fire alarm which caused elevator problems on the morning we were leaving. Thank you for your review; glad you had a great stay other than the untimely fire alarm. Of course, there is never a good time for those. It was the best. The condo was very clean. Front desk was very courteous. Very knowledgeable. We will be back. Thank you for staying with us and for your wonderful comments regarding the condo and also our front desk staff. We would love to have you back as our guest. More than I expected. Compared to other places we have rented for short vacations, this was by far one of the best. Clean, quite and very roomy. There was seven of us that stayed here and we all had plenty of room, never felt crowded. Very convenient to shoppinig, eating and things to do for family and kids. From outside the condo grounds to inside of the condo, no complaints. Wished we could have stayed longer. Planning for another visit soon and hope we are able to rent our stay from here. Totally awesome. Thank you for your feedback! So happy you found us and enjoyed your stay. We appreciate your patronage and look forward to your next visit. great place will rent again. Thank you for your comment and plans to visit us again. Glad you enjoyed your stay in unit 554. Our stay in mid-January in WP554 was "interesting". The condo itself is fantastic ... very spacious, comfortable, and well-appointed. Unfortunately, we spent way too much time in the condo, as 4 out of 6 in our party had a 24-36 hour bug, where someone was down virtually the whole 3-day weekend. Thankfully we brought games and a jigsaw puzzle to keep us occupied. We commented several times, "I don't think I've ever actually stayed inside a condo more than this trip!" We are so glad to hear you enjoyed condo WP554! We are sorry to hear you were not feeling well during your stay and hope your next stay with us will be a healthier one! We look forward to seeing you next time. I was very happy with our rental. It was clean and the staff was wonderful. Thank you so much for staying with us at Whispering Pines. We are so happy to know that you were very happy with your stay, the cleanliness of the condo and our staff. We hope to see you in 2015. We had a great time. Love staying at Whispering Pines. Thank you for choosing to stay with us! We appreciate you so much and will look for you in the future! our opinions is the best show in Pigeon Forge. went for the first time to Timber Woods. It was the best ribs several of us had ever had. Chedders, which is pretty new, we also enjoyed. recommend to anyone going to Pigeon Forge to give Whispering Pines a try. You will be addicted to it! Thank you!!! Thank you so very much for your wonderful review of your recent Whispering Pines stay. We loved that you shared your amazing love and friendship story with us. We are so pleased that the four bedroom condo worked out so well for you, we were happy to upgrade you. Your kind comments mean so much to us. We are thrilled to know you all had such an amazing time. We hope you can visit with us again to make more lasting memories. Thank you so much for being a loyal repeat guest at Whispering Pines. We really do appreciate you, most of our guests feel more like family than visitors. We look forward to seeing you again soon. This was our first time staying at Whispering Pines & I'm proud to say it won't be our last! We have stayed in cabins, hotels & other condos before however none of them come close to Whispering Pines! Our condo was very clean. Everyone was extremely nice & helpful! Check in was a breeze & you can't beat their discount ticket offers! Absolutely loved our 4 night stay! Thank you so much for your amazing review. We are so happy to hear that you enjoyed your 1st stay at Whispering Pines so much. We want to express how much we appreciate you as our guest and your comments mean so much. We can't wait to see you again. We have stayed at Whispering Pines since the late 90's, We love it here!!! Thank you Vickie for being a loyal guest at Whispering Pines. We appreciate you and cant wait to see you again! Whispering Pines is a very nice resort with a great location in Pigeon Forge. The condo, #554, was very clean, spacious, and beautifully decorated. The pool area was well maintained, though very loud at times. Parking spaces were plentiful, but very narrow and tight. The only negative was that dumpsters were NOT where the information sheets reported them to be and resulted in time wasted searching for a place to dispose of trash bags. Please update your info sheets! Thank you so much for staying with us. We are so happy to hear that you enjoyed your stay in condo 554. We sincerely apologize that you received the incorrect information regarding the dumpster location. We were in the process of changing all of our literature about the removal of the dumpster which was requested by the city of Pigeon Forge. We are sorry for the inconvenience this caused you during your stay. We hope to see you again soon. Condo very spacious! Everything we needed was there. Great family weekend! Glad you were able to make some family memories while staying with us! Please come back and visit us again! Our room was clean and ready for us upon check-in. We were given all the information we needed along with some added perks we did not know about. The staff was so friendly and helpful. Our stay was great, we enjoyed being close to the activities. Loved the pools and lazy river. We are delighted to hear that you had a great stay with us at Whispering Pines. We are extremely pleased that you found the the staff friendly & helpful at check-in. We love our guests & are happy to offer perks during your stay. Please come back & stay with us again soon!